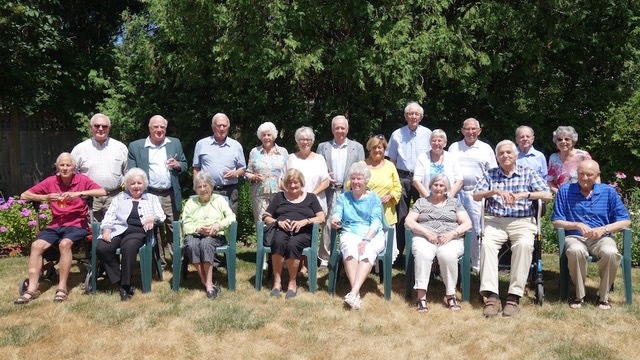 Above: Members of the Class of 1956 with their spouses at a luncheon in 2017. 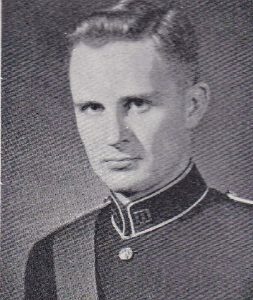 “Col Sawyer, Director of Studies, selected some of the highest scoring fall term recruits and conned most of us into taking Chemical Engineering. It turned out good for me,” he said. John Rutherford released from the Royal Canadian Engineers in 1960 to return to grad school. He earned his MA (Math) at Queens in 1963 and his PhD at Virginia Tech in 1966. He was back at RMC from 1960-1961 to teach Mathematics, Statistics, and Operations Research, and then again after earning his PhD from 1965-1968 as an Associate Prof.
John joined DuPont Research Laboratories in Kingston in 1968 and moved on to the Federal Public Service in 1974. While there he spent most of his time with the Office of the Auditor General. He retired in 1989. The August lunch in 2018. Well done John. I recall so well your first few days as a recruit. I had a single bar and was assigned to supervise you and McLachlan in 3 squadron. I, however, cannot take much of the credit!